SixtensFoundation.org: READY! SET! GO! The Race is Tomorrow! Get Your T-Shirt! READY! SET! GO! The Race is Tomorrow! Get Your T-Shirt! 1) If you don't know anyone running who you can sponsor and can't make it yourself, you can still donate to Sixten's Foundation through here or the PayPal button on this blog. Remember, Sixten's sponsorship sheet gets all of these donations, and we'd love to see him win by getting the most donations! 2) We have a very talented designer and volunteer working with us named Lorenzo d'Aubert. He designed the event flyers you may have seen, some other materials and the smashing t-shirt pictured in this post. If you recall, the t-shirts are available for free to anyone who raised $50 in sponsorships, but you can also buy one (or more!) for only $15 each. They are of terrific quality (Jerzees, Heavyweight blend, 50/50) and available in Adult S, M, L and XL and Child sizes S, M and L. You can send the money to PayPal, drop a check to the Sixten's Foundation mail address or just let Anna or Robert know you want one at 301.805.9406 or sixtensfoundation@gmail.com. 3) Anna and Robert will be at the race by about 7:15 a.m. 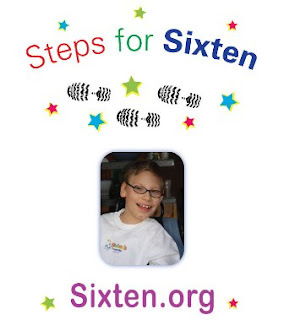 Remember, this event is the Riverfront Revolution race, and "Steps for Sixten" is simply our group within it. Greg Taylor of Riverfront Revolution has very generously consented to allow us to share the race space with his group, but their registration area will have no information on Sixten's Foundation. Please call Anna's cell phone at 301.805.9406 if you need help locating us. If you haven't registered yet, there's still time. Just go to http://www.riverfrontrevolution.com/register.html, and we'll see you there!